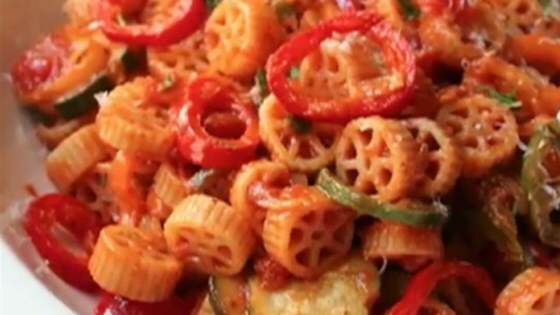 "Rotelle pasta, an assortment of colorful sweet and hot pepper rings, and slices of zucchini make the wheels in this easy summer pasta. There are all types of summer vegetables you can use, and if you have some leftover chicken you're trying to sneak into something, this would be perfect." Place heavy skillet over medium heat and pour olive oil into hot skillet; add green onions and anchovy fillet. Cook and stir until anchovy breaks down and green onions are tender, 2 to 3 minutes. Add garlic to skillet and cook until translucent, about 1 minute. Stir zucchini into green onion mixture; cook, stirring occasionally, until zucchini slices just start to become tender, about 2 minutes. Sprinkle with salt and black pepper; cook until zucchini centers start to change color to slightly green, 1 to 2 more minutes. Pour tomato sauce and chicken stock into skillet. Reduce heat to low; add sugar. Mix jalapeno, Fresno, yellow mini pepper, and orange mini pepper rings into mixture. Bring sauce to a simmer and reduce heat to low. Pour rotelle pasta into boiling water and cook, stirring often, until pasta is still slightly firm, about 7 minutes. Drain and let pasta stand for 2 minutes. Bring sauce to a boil; stir in rotelle pasta. Reduce heat to medium. Cook, stirring often, until pasta, zucchini, and peppers are tender, 2 to 3 more minutes. Taste and adjust levels of salt and black pepper. Mix in about 1 1/2 teaspoon parsley. Serve in bowls and top with Parmigiano-Reggiano cheese and remaining 1/2 teaspoon parsley. A spicy summer tomato sauce with chile peppers and zucchini. To prepare peppers: Cut into thin slices; most of the pepper seeds will fall out. Push centers with seeds out of rings. Drain rings in cold water and most of the remaining seeds will wash away and sink to the bottom. To prepare zucchini: Use the channel knife on the side of a zester (a small metal piece sticking out of the flat portion of the zester) to cut strips of peel from the zucchini, leaving stripes of peeled and unpeeled zucchini. Slice into wheels.